If you’re a fan of the extremely popular 2004 film “Mean Girls,” then you’ll be thrilled to hear about the new musical adaption! With music and lyrics by Jeff Richmond and Nell Benjamin, and a book by Tina Fey, the creator of the original film, Mean Girls: The Musical, is a fun, highly engaging, and hilarious look at the popularity contests and cliques of high school life in a way that gets to the serious core of its subject matter while remaining a light and highly enjoyable watch. Tickets on sale now!! Based on the semi-guide-book nonfiction work “Queen Bees and Wannabes”, by Rosalind Wiseman in 2002, Mean Girls follows the story of 16-year-old Cady Heron. Moving back to the US after having spent the last 12 years of her life homeschooled by her parents as they researched in Africa – making her an immediate oddity. Falling in easily with fellow misfits Janis Ian and Damian Leigh, Cady is warned by the others to avoid the most prominent of the school’s popularity groups: “the Plastics” led by the confident and nasty Regina George with the wealthy, insecure Gretchen Wieners and confused but well-meaning Karen Smith. However Cady’s lack of history means she isn’t of total disinterest to the Plastics, and when Janis sees her getting along well enough with them on a lunch break, she devises a plan of revenge against Regina, using Cady to infiltrate the group. Initially averse to this idea, Cady’s motives change after she unwittingly makes Regina jealous by developing a crush on her ex-boyfriend. Spurred on by Regina’s spiteful actions in response, she begins to carry out the plans in earnest, gradually making Regina’s life hell – but running the all-too-real risk of, in adopting her cruel behaviors to combat her, eventually turning into a replica of Regina herself. 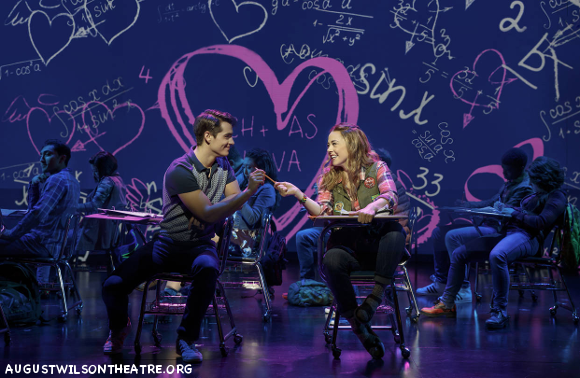 The Mean Girls musical premiered at the National Theatre in Washington, for two months in October 2017. Greeted with a positive response, the musical moved on to preview on Broadway at the August Wilson Theatre on March 12, 2018, and opened officially on April 8, 2018. Directed and choreographed by Casey Nicholaw and produced by Lorne Michaels and Stuart Thompson, the musical also features as costumes by Gregg Barnes, scenic design by Scott Pask, video design by Finn Ross and Adam Young, lighting by Kenneth Posner and sound by Brian Ronan. 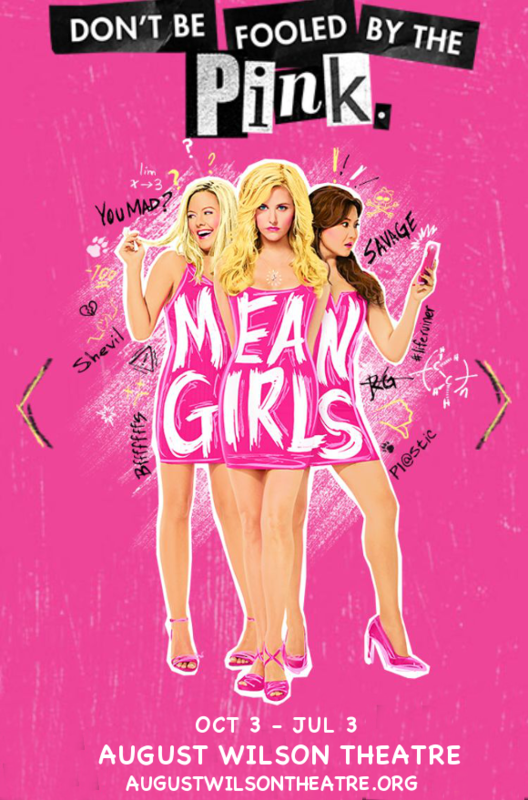 The team behind Mean Girls is a highly talented one, and it shows – the musical was nominated for no less than 12 Tony Awards and 8 Drama Desk Awards, winning the award for Outstanding Book Of A Musical. In terms of script and plot, fans will be pleased to know that the musical follows the film quite closely, including several of its most popular lines that have seeped into popular culture today – those who haven’t even seen the film are likely to be familiar with the lines “You go, Glen Coco!” and “She doesn’t even go here!” The comedic material is much the same, with snappy lines and witty dialogue. What the musical version adds is all-new emotion and meaning conveyed by Casey Nicholaw’s superlative choreography, as well as a higher level of focus and humanity given to the musical’s secondary characters. Finally, of course, it gives Mean Girls songs!! Accompanied by live musicians and featuring a range of genres from traditional musical theatre to rap, the score of Mean Girls: The Musical is likely to stay in your head for days on end. This isn’t one to miss – and if you loved the original film, you absolutely can’t afford to! Get your tickets NOW while they last! !